Imagine being less than two feet tall and having to navigate the luggage carousel at one of the busiest airports in America. 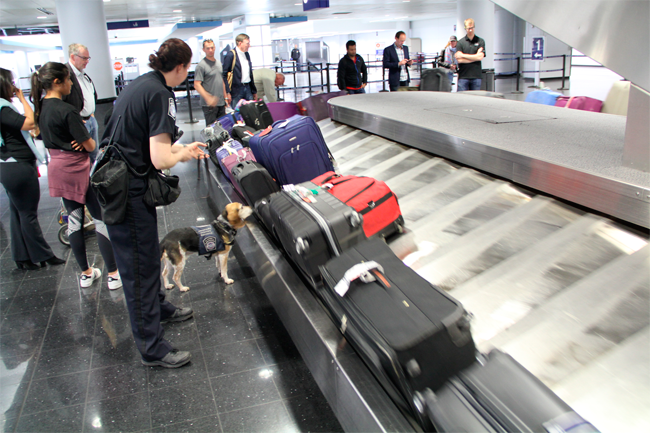 This could be a daunting and intimidating task, but every day a non-intimidating canine battles through the large crowds sniffing backpacks and luggage looking for food. Frodo’s specialty is finding apples, citrus, mangoes, beef and pork. As the luggage carousel turns, Frodo is hard at work, standing on his hind legs to sniff the backpacks people are wearing and walking among the lines of people collecting their bags. Frodo is trained to provide a passive response to target odours. If he finds something, he will sit down, alerting Anderson that he is on to an odour. As soon as this happens, Anderson intervenes and asks the passenger if they have any food items in their bag. “This is usually the time the passenger remembers they do have something,” Anderson explained. While Frodo looks like a dog you want to pet and snuggle up with, when he is working, petting him can be a distraction and is not allowed. Most of the agricultural canines are rescue dogs, sourced from a shelter. Rescue beagles are usually between one and three years old when procured by the academy for this programme. “The retirement age for beagles is usually nine years, but because they are rescue dogs we don’t know their exact age,” said Anderson. 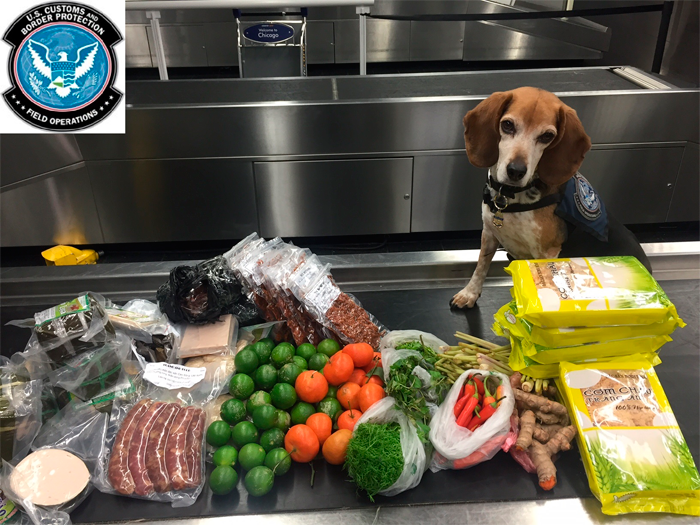 “As long as the beagle has a high food drive, wants food more than anything else in the world, and is between the ages of one and three, we may rescue and train them. The age requirement is in place because we want the most productive years from the dog during service,” stated Anderson. Beagles are one of the healthiest breeds, with an average lifespan of 15 years. Additionally, they are smaller dogs that eat less than larger breeds, and because they are rescue dogs, CBP does not have to rely on breeders. Each beagle goes through a training period of 10 weeks with the paired handler. During the training, handlers become familiar with the dog before they are put to work at their respective port of entry. Each pup can find various plants, meats, fruits and vegetables, in addition to the training odours of apples, citrus, mangoes, beef and pork. “I believe there was a survey and these training odours were the five most commonly found items,” Anderson said. “This data allowed us to hone in and train the dogs in what to search for.” The training doesn’t stop once they are certified. These canines and their handlers have to recertify every year. Frodo isn’t just looking for his five main food groups. He has found a commercial shipment of dog bones, packed in suitcases, elephant hair bracelets, bird’s nest soup from Vietnam, and other extravagant items. To date, Frodo is responsible for seizures amounting to almost 100,000 US dollars. Though Frodo doesn’t work a 9-5 job, he works an hour-on/hour-off schedule, and sometimes that may vary given operational volumes. This is because “dogs aren’t machines,” as Anderson remarked. Frodo is between seven and nine years old, so he probably has about one more year on the job; after that, he will be retired.